The ECM controls the cruise control system of the vehicle. The data and DTCs relating to the cruise control system can be read from the DLC3 of the vehicle. If either DTC or CRUISE OK is not displayed on the multi-information display on the combination meter assembly when checking for DTCs, there may be a problem with either the combination meter assembly or the CAN communication system. Use the Techstream to check and solve the problem. (b) Check that the CRUISE main indicator light illuminates when the cruise control main switch is turned on, and that the indicator light turns off when the main switch is turned off. 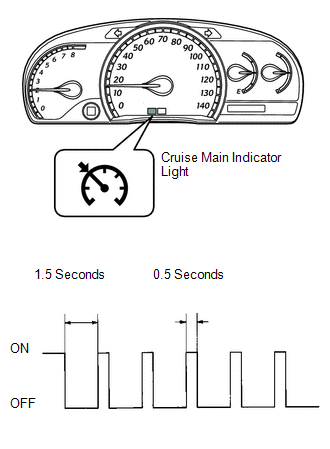 If the results are not as specified, inspect the Cruise Main Indicator Light Circuit (See page ). While driving with cruise control, the ECM activates AUTO CANCEL of the cruise control system when a malfunction occurs in one of the following: vehicle speed sensors, stop light switch assembly, or other related parts. When AUTO CANCEL is activated, the CRUISE main indicator light outputs the blinking pattern shown in the illustration. At the same time, data of the malfunction is stored as a DTC.